Nick Robinson is a familiar voice and image as the BBC’s political editor. With that, I always thought came responsibility. Of late, Nick Robinson seems to have been pushing the boundaries of his brief. During the Scottish Independence campaign, Robinson was accused of pro-union bias. But Robinson is increasingly indiscreet when it comes to images of himself. 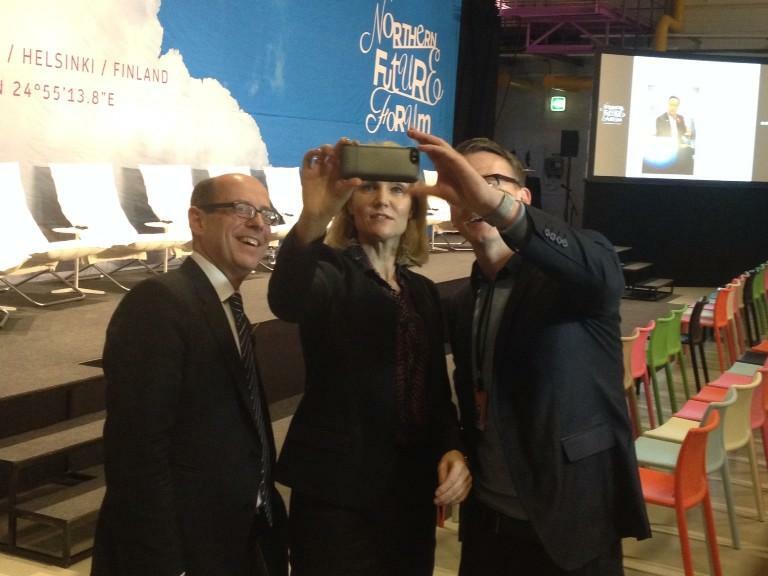 For example, in posing in a ‘selfie’ by the Danish PM, Helle Thorning-Schmidt (right). Essentially, his though must have been that anything that is good enough for President Obama (he had a selfie with Helle Thorning-Schmidt at Nelson Mandala’s funeral) is good enough for him. Well, maybe, but how does one explain his latest photo opportunity? 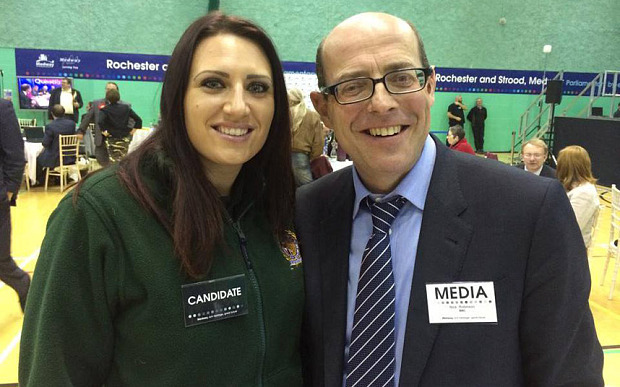 At the election count of the recent Rochester By-election in the UK, he allowed himself to be compromised with a shared picture with the fascist candidate Jayda Fransen, of Britain First (left). He has argued that it was a mistake. He was invited to have his picture taken and without too much thought, he posed. But he is the political editor of the BBC, not some trainee. Moreover, his penchant for photographs featuring himself is worrying. As for Jayda Fransen, what a coup. Let us not forget, also, that Britain First removed themselves from the ballot paper and pledged support to UKIP so as not to split the right-wing vote. Naturally, this exhibition displays an authentic VW Beetle; though you do not need to pay the £10 admission fee to see it. It merely entices visitors in. First, let me say that I went with my German partner. 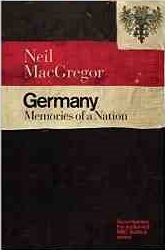 Her endorsement of the exhibition is praise indeed, knowing all too well that the English, particularly, focus on the country’s Nazi past. This exhibition has something else important to say about the German Nation’s history. Okay, now to a few quibbles. First, normally I expect to be able to take photographs in an exhibition, not least to upload to this blog. But, here, photography is not allowed. And it is enforced. One assumes this is to protect the value of the accompanying products that one can buy in the shop including Neil MacGregor’s thick tome (right). Second, the British Museum is huge. For some reason, the powers that be at the Museum have located this exhibition in, what amounts to, a cupboard. The space is far too small not only for the numbers of visitors, but also the exhibits themselves. And for some inexplicable reason, the British Museum does not seem to have learned too much about exhibiting. For example, in the years of German hyperinflation, German towns produced their own currencies -they being as valuable as the national currency. Such is the nature of hyperinflation. The towns printed their own bank notes. They were often colourfully printed with very particular designs. In essence, they demanded a very close scrutiny. 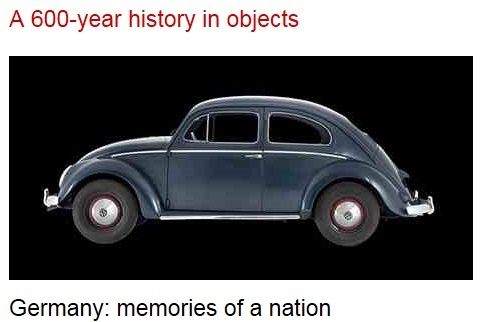 But the museum has made it virtually impossible to scrutinise these artefacts. They are locked in a glass case set against a wall. They are three or four abreast. Unless one is 2 metres tall, inspecting the detail is impossible. And even those artefacts that are not in glass cases (most seem to be), they are not exhibited at the height that best suits most of us. Take, for example, the exquisite Strasbourg Clock (left). 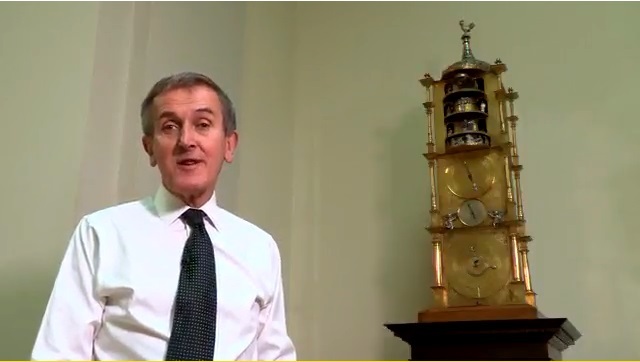 This image features Neil MacGregor, the boss of the British Museum and the author of the book and presenter of the 30-part BBC radio series accompanying the exhibition. The clock enjoys amazing detail in terms of figures and engravings over-and-above the feat of timekeeping technology that makes it work. And rest assured, it is amazing. But actually, I saw more of it on the BBC website (http://www.bbc.co.uk/programmes/p028bdxq) than I did at the exhibition. I’m just not tall enough. 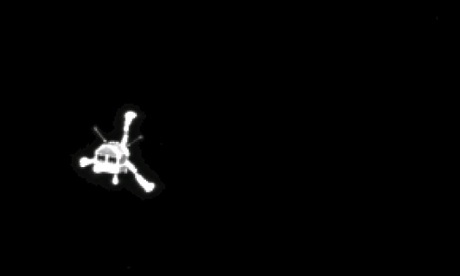 The European Space Agency has, in the last 10 minutes, landed a probe (left) on the surface of a comet for the first time. This is important as it may help explain the origins of life on Earth as comets were there at the formation of the solar system. Notwithstanding the technical feat associated with achieving a landing on a rocky object travelling at 18km/s and is 510 million kilometers away (it takes over 30 minutes to get a signal back to Earth from the craft). The UK Conservatives now argue that too many people – cast out on to the Mediterranean Sea in unsuitable boats by unscrupulous traffickers – have been saved by benevolent Europeans. So much so that it generates an incentive for more people to try it, safe in the knowledge that they will be rescued when the vessel capsizes. Even if this were true – and no hard evidence to my knowledge has been presented to back it up – it is immoral. Knowingly ignoring victims of traffickers, fleeing from wars, economic crises and penuary caused largely by us is criminal. 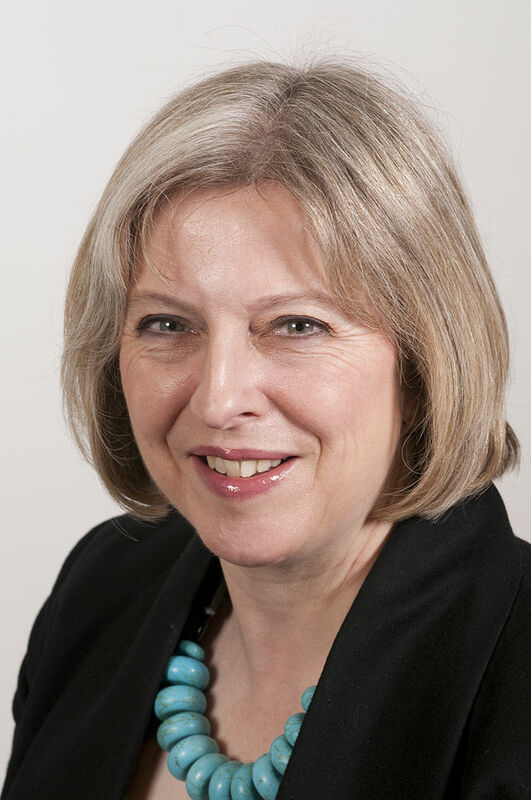 And again, leading the way is the Home Secretary, Theresa May (above left). I used to think that these illiberal and racist policies were a response to UKIP. Now, however, I sense that UKIP is merely an excuse. The Conservatives really do believe in these policies. 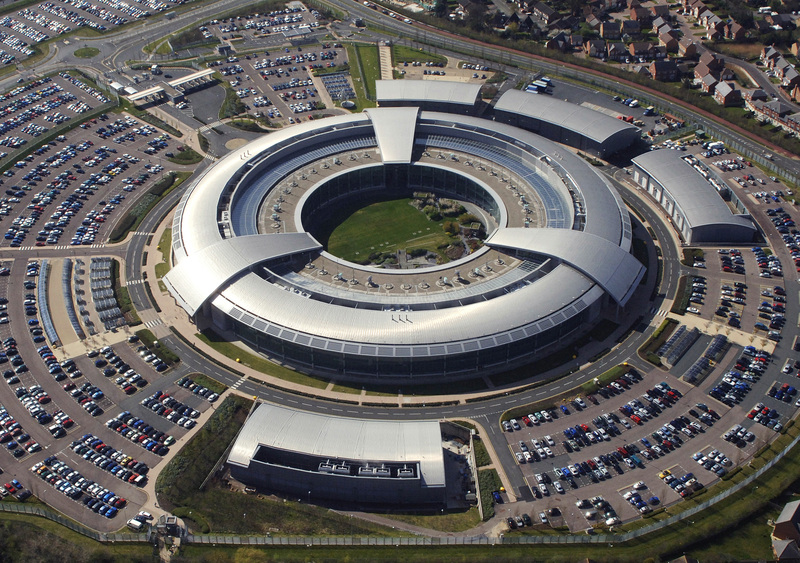 The new boss of GCHQ, Robert Hannigan, this week wrote a much-reported article in the Financial Times arguing that in order to stay safe we must give up our [right to] privacy. We must accept blanket surveillance of our online communications. He is frustrated that the large US tech firms that dominate the social media world are uncooperative. Consequently they are the ‘command and control networks of choice’ of international terrorists and paedophiles. Well, he would say that, wouldn’t he? Here is a man whose job it is to do communication surveillance. In recent years – and certainly since Snowden – its legitimacy has been questioned. We may have asked, ‘in whose interests is this surveillance’? And if it is for us – citizens – then how would we know? We are never given the data that would tell us how effective it is in preventing attacks or the abuse of children. Now, Mr Hannigan (right) has asserted that all of CGHQ’s surveillance is undertaken to protect us against attack from whomever or whatever. Again, there is no evidence that surveillance protects us, but the security services remain powerful arms of the state. The more surveillance they do, the more money they get. The more they convince us that only more surveillance can protect us – and we believe it – the more resources they will command and the less free we will be. And bearing in mind they tell us that surveillance is needed to keep us free, one wonders what kind of freedom they have in mind. Naturally, the ‘if you have nothing to hide you have nothing to fear’ argument still resonates. But as Martha Lane Fox – one time government-appointed Tsar for digital inclusion and founder of lastminute.com – and anything but a crazy libertarian – said through a number of new and old media yesterday, “I would not want GCHQ to come and rummage in my front room and that is how I feel about whatever device I am using”. Moreover, the security services already have significant powers to investigate communication, not least through DRIP which a subservient UK Parliament rushed into law before the summer recess in 2014. Again, at the behest of the security services. But what these people really dislike is the idea that ordinary people can encrypt their own communication. On the whole, our communication is unencrypted. The devices that we use are easily accessible to outside forces (with a few exceptions, notably Blackberry handsets). When we download an app we invariable sign away privacy in order to use it. But I do feel that I – and others – have a right to privacy and that the security services have enough power already to investigate any wrongdoing on my part. But they do need, first, to have sufficient evidence to get the warrant to invade my privacy. They are not the rights holders. We are. The Rochester and Strood by-election was caused by the resignation of the incumbent Conservative, Mark Reckless, as a result of his defection to UKIP. The by-election is an opportunity for any number of disgruntled people to stand for election. By-elections – particularly towards the end of a parliamentary period – often throw up surprises. Probably not enough to elect Britain First’s candidate, Jayda Fransen. 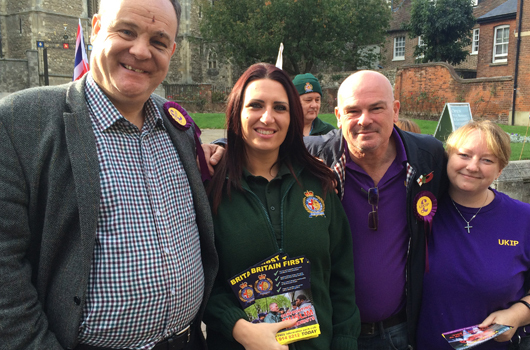 Never mind, she seems quite friendly with UKIPers if this happy photo is anything to go by. Might they have much in common? 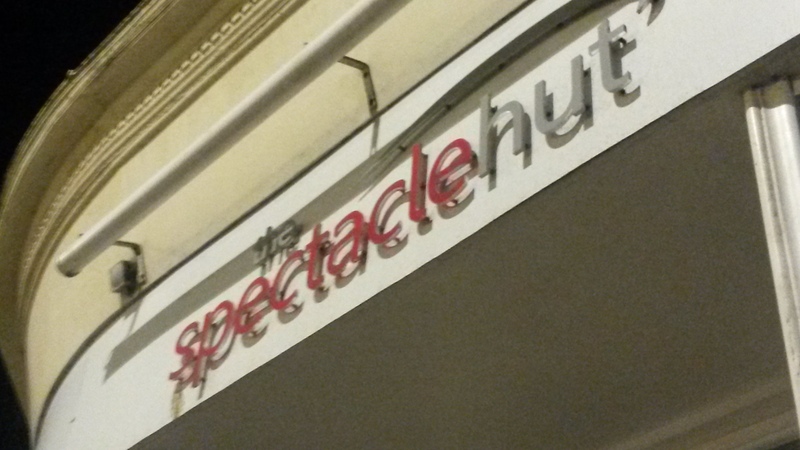 This is Spectacle Hut in Hastings, UK. Nothing special, just one of those high-street opticians. They are open 7 days a week and there are eyesight test appointments available on Sundays. And how do we know this? Well through a crass poster (right). Now I’m an atheist and certainly no friend of the Catholic Church; but this is just insulting. Put a fully made-up model in a nun’s habit and hey presto, point made. 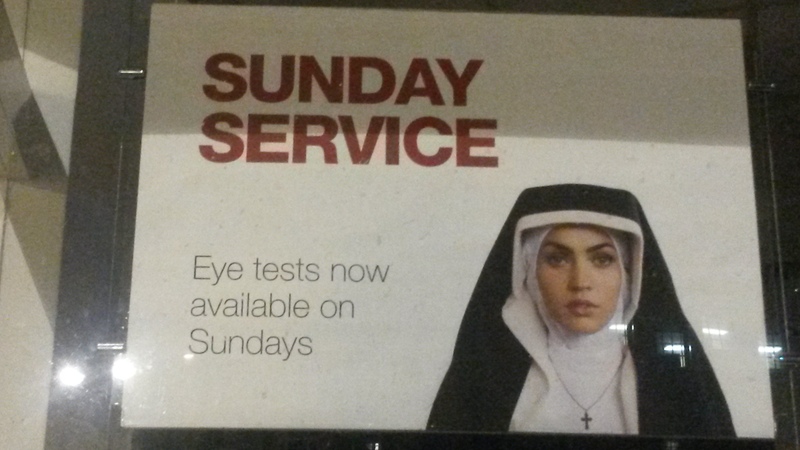 Spectacle Hut, if you are going to stoop this low, at least use a real nun.